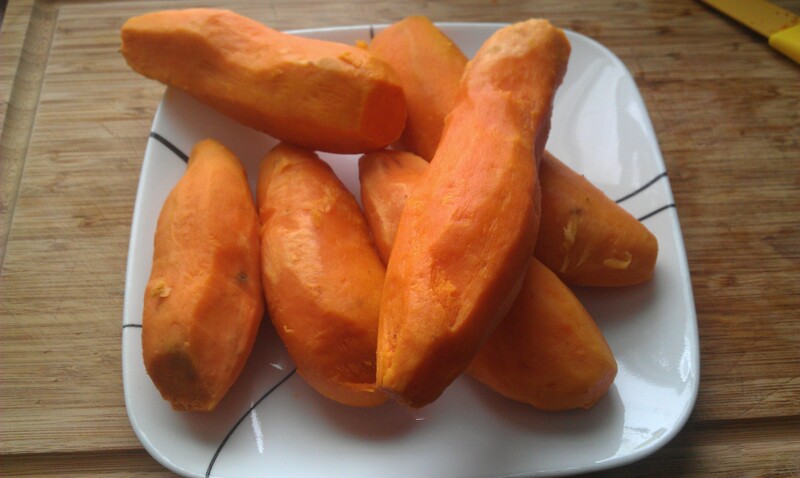 Sweet potatoes are a veggie that isn’t too hard to get into my kids. They love to eat them and when they are made there usually isn’t a bite left. We usually have them one of two ways, however, either as store bought fries or baked and served with honey butter and cinnamon. So when the opportunity for me to play in the kitchen on a cold day presented itself today I decided to see if you could make a scalloped sweet potato. Quick search and I get this recipe from Allrecipes.com and I figured this could be a good way to start playing with this method of cooking sweet potatoes as there are several different recipes and styles that can be found when you do an internet search. Whenever I used a recipe from Allrecipes.com I take the time to read through the comments from previous users and see what suggestions I can glean esp when I find I haven’t got an ingredient on hand. In this case I took a suggestion from a poster to grate the apples instead of slicing them and substituted the mace with a combination of half cinnamon and half nutmeg. I think next time I make I will give using apple slices a try. Getting ready to soften my sweet potatoes. Now this is the first time I’ve ever done a partial boil on a potato, sweet or otherwise. So I will admit to feeling just a bit overwhelmed by the thought because letting it go too far will, of course, make these potatoes far to soft to be peeled and sliced. When the water came to a boil I checked it every few minutes and once I could feel the potatoes getting soft, but not squishy, I took the pot off the heat and then pulled my potatoes out of the water and put them on a plate to cool. 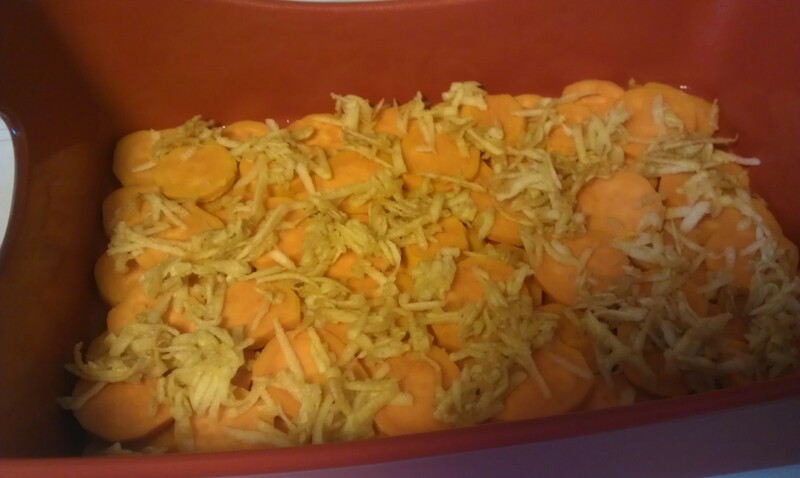 I let the potatoes cool so that I could easily handle them and then went to peel the skins off. I used a small paring knife and for the most part the skins came off with little effort. There were some parts where the skins didn’t want to come easily but a small wiggle of the knife worked through them and there wasn’t many of them. Sliced and ready to go. Amazing how much these look like carrots. One of the things I am having to learn as I work on my culinary skills is how to estimate and visualize the amount you get when you break ingredients down. 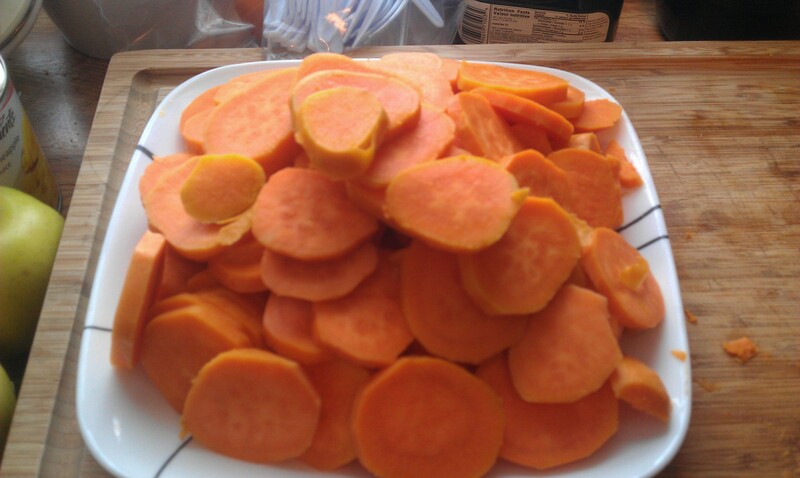 For example, when I had boiled and peeled the sweet potatoes but before I sliced them I was unsure that I would have enough for a 13 x9 pan. So I was really surprised as I was slicing the sweet potatoes to find I had really did a good amount to make this dish with. First layer in the pan. The layering process went quickly. One quick layer of sweet potatoes and then I used the grated apple almost as you would use parmesan in a traditional style scalloped potato. With the sugar and spice sprinkled on top and the first butter layer you can a great idea how these flavours are going to come together. The house smelled warm and welcoming as these cooked up and when I put the pan on the table the kids were very excited to try and my eldest called dibs on seconds after taking the first bite. I am looking forward to making these again. 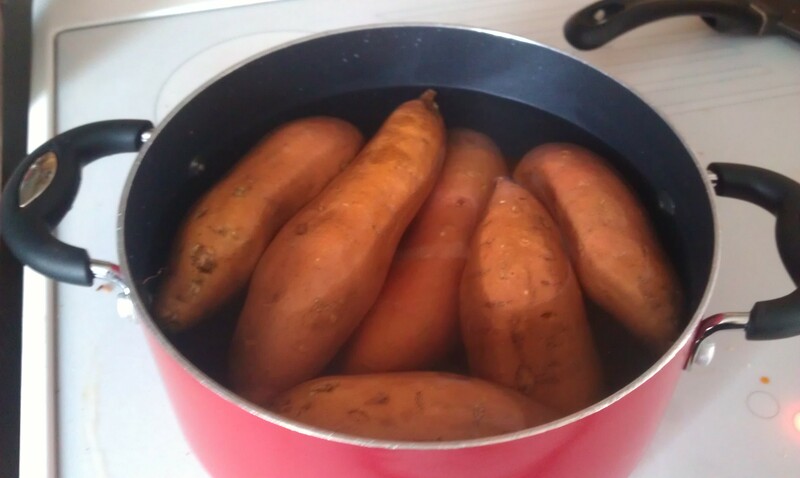 Place sweet potatoes in a large pot with enough water to cover, and bring to a boil. Boil until tender, then cool, peel, and cut into 1/4 inch slices. 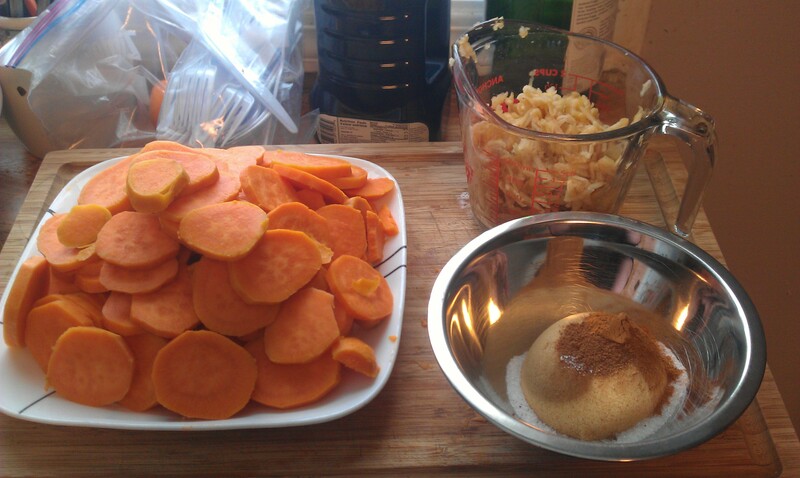 Arrange half the sweet potatoes in the bottom of the prepared baking dish. 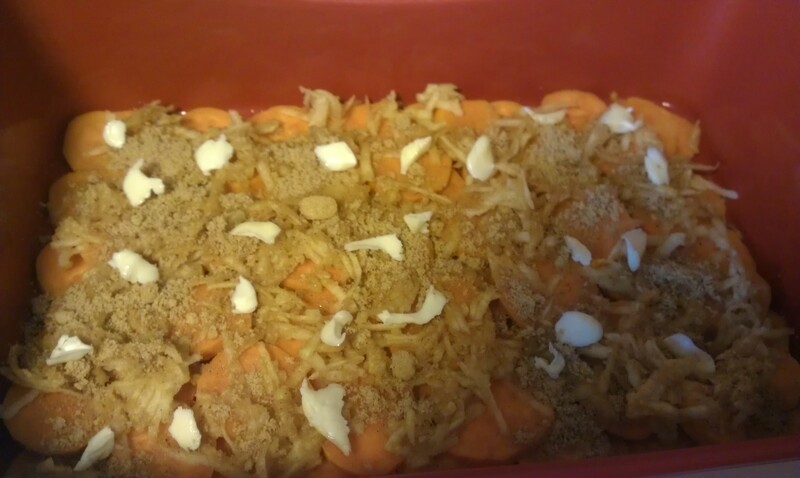 Layer half of the apples over the sweet potatoes. In a small bowl, mix together brown sugar, salt, and mace, then sprinkle half of the mixture over the apple layer. Dot with half the butter. Repeat layers of sweet potato and apple, and top with remaining brown sugar mixture and butter. Bake in the preheated oven for 50 minutes, until apples are tender and top is golden brown. Posted on March 4, 2013 by Shirley Robert	• This entry was posted in Cooking with Kids, Recipes and tagged Allrecipes.com, apple, apple slices, brown sugar, butter, cinnamon, cooking sweet potatoes, food, Granny Smith, granny smith apples, grated, nutmeg, scalloped, sweet potato, vegetable, vegetarian. Bookmark the permalink.